J. GieraÅ‚towski, J. J. Å»ebrowski, and R. Baranowski, "Multiscale multifractal analysis of heart rate variability recordings with a large number of occurrences of arrhythmia," Phys. Rev. E 85, 021915 (2012) [DOI: 10.1103/PhysRevE.85.021915]. Multiscale multifractal analysis (MMA) (GieraÅ‚towski et al., 2012) is a time series analysis method, designed to describe scaling properties of fluctuations within the signal analyzed. 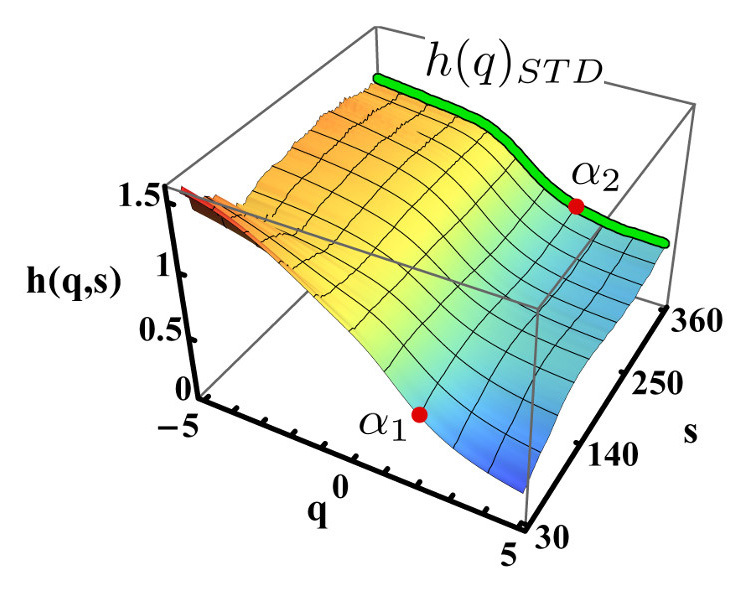 The main result of this procedure is the so called Hurst surface h(q,s) , which is a dependence of the local Hurst exponent h (fluctuation scaling exponent) on the multifractal parameter q (Kantelhardt et al., 2002) and the scale of observation s (data window width). Sample4_mono_multi_fractal_phase_transition - Special example of time series with strong multifractal properties for short scales s and with strong monofractal properties for small scales s. Time series used as an example in (GieraÅ‚towski et al. 2012) (see Fig. 3). [GieraÅ‚towski et al., 2012] J. GieraÅ‚towski, J. J. Å»ebrowski, and R. Baranowski, "Multiscale multifractal analysis of heart rate variability recordings with a large number of occurrences of arrhythmia," Phys. Rev. E 85, 021915 (2012) [DOI: 10.1103/PhysRevE.85.021915].